Some years earlier, Linda had come across some recordings in the Library of Congress that had been collected during a field recording expedition by two American brothers - the Fahnestocks - in 1941. (Apparently they had been doing a little field-reconnaissance for the American government too, in anticipation of the expected Japanese occupation as part of the war in the Pacific. Their timing turned out to be impeccable - they returned from Bali in September 1941, less than a week before the attack on Pearl Harbor. Within a month the Dutch West-Indies had fallen to the Japanese). The recordings, on acetate-coated aluminum disks, had languished in an attic for 40 years before being donated to the Library of Congress in 1986 - some of these have since been released on the CD "Music for the Gods" (Rykodisk). The music, scratchy and distant, seems to come down to us from a distant past before the advent of the tourist hoardes and major Western influence. Linda had transcribed one of these pieces and taught it to us - we knew it as "Unnamed Piece from Fahnestock Expedition, 1941", or simply "1941". It was a beautiful and haunting piece. After searching around for some years, Linda managed to track down the village that the piece had come from, and had even met some of the musicians, now in old age, that had played for the Fahnestock brothers on the original recordings. The village was Kamasan. We arrived in Kamasan and were ushered into a room where we were introduced to the village elders, who produced tea and cookies for us. We were evidently distinguished visiting dignitaries, and felt we had to be on our best behaviour. Linda did most of the talking, as she was the only one of us that spoke Indonesian. She presented the elders with a recording of the original version of "1941", which they listened to with interest. But it was all a bit stiff and formal, and we were relieved and excited (and not a little nervous!) when they suggested we adjourn to the gamelan room to play. In the gamelan room were several sets of instruments, including the set that had been used on the original recording of "1941" - this was one of them. We were in awe, and recorded each of the notes carefully so we could again study the recordings and compare the pitches as recorded to the actual pitches of the instruments themselves. 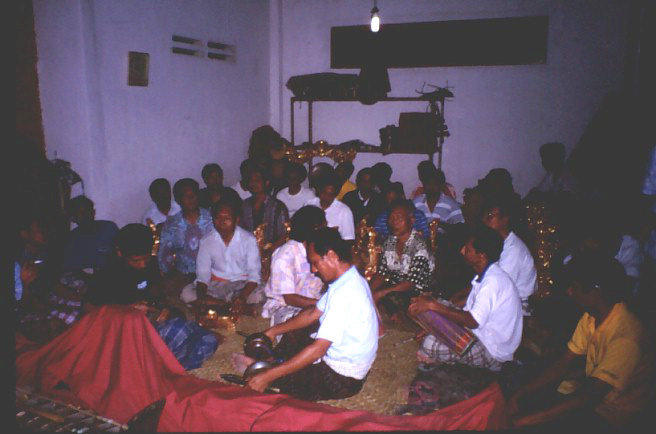 First, the Kamasan village gamelan played for us - an amazing piece, full of jangling complexity. 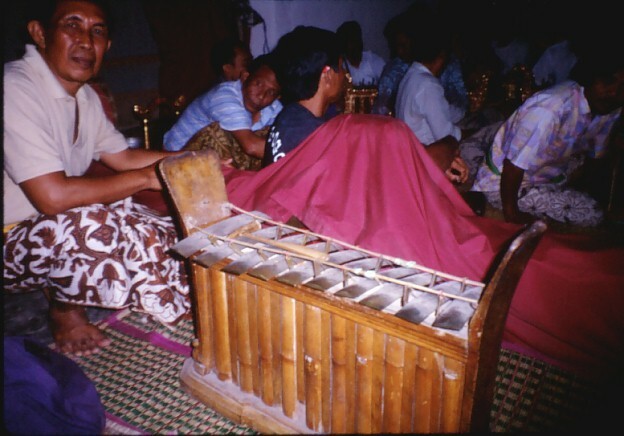 Their angklung uses the old-style bar-bell reyong you can see in the foreground here. Then it was our turn to play. With some trepidation we took our places amongst the players - the gong player seemed a little taken aback to see that Astrid (a woman!) was our gong player, and handed over his panggul with some reluctance! Linda struck up the opening notes of "1941". 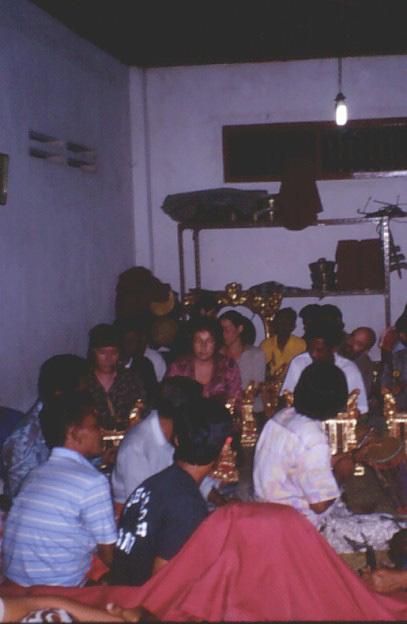 I had expected that we were bringing a long-lost piece back to the village from which it had come, but as Linda finished the introductory phrase, the entire gamelan joined in! They played incredibly - with such energy, and gusto! It was an incredible experience having played gamelan music for years back at home, to now be playing in Bali with a real Balinese gamelan. As they played though, to our consternation they were getting faster and faster! Sweat was breaking out on our brows, as the tune cycled around and around. When we thought it couldn't get any faster, the tempo picked up even more! Astrid impressed the gong player by knowing when to hit the gong without being told, and we held our own through this break-neck rendition. Everyone collapsed in laughter as it came to an end - it was such fun! 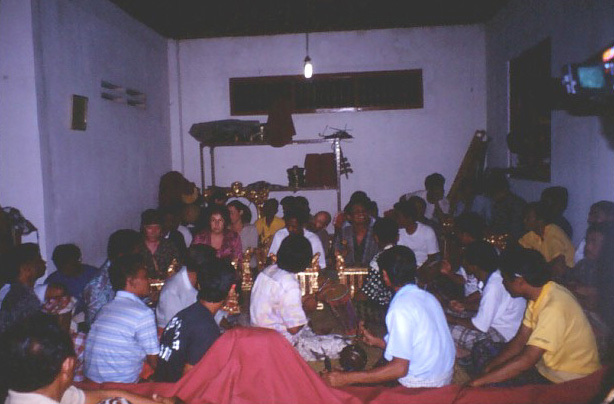 Evidently the piece had evolved in the Balinese oral tradition since it was recorded in 1941, and had gained a lot more energy since then! Also the way in which the two parts of the melody were divided between the different players minimized the amount of movement that a player's hammer had to make, allowing them to play a lot faster than we could with our transcription. Here you can see Linda in the pink top, with me to the left, Justine behind her, and Steve (with shaved head) to the right of Justine. Astrid is barely visible on the gong at the back, just above Linda's head. Click on the photo for a larger view. Our jegogan player, Pierre-Olivier, is out of this photo, to the far right. After "1941" we decided to play them a piece they couldn't possibly have ever heard before - a piece that Sedana had composed in Santa Cruz especially for our UCSC gamelan, called "Banana Slug Climbing Redwood Tree". We started to play, but within a few notes the other players were joining in too - extrapolating the notes and fitting in where it seemed to make sense to them. By the time we came to the second cycle, they had the piece down, and with a deft tap of the drum, they took off, practically leaving us in the dust again! They were amazing musicians - especially when you think they were rice-farmers by day, and had probably never had any formal musical training. We left Kamasan late at night and somehow made it back to Ubud through the unlit streets in pitch darkness. It had been an amazing day and it was hard to tear ourselved away from our new-found friends. We even learned that there was a third part to "1941"! Linda invited us all out to a late-night drink and ice-cream at Nomad's to celebrate a huge success. Even then the music hadn't stopped - we were cajoled into playing the instruments that the "house band" played in the restaurant, including a strange split gong the likes of which we'd never seen before. Definitely one of the highlights of our entire trip.